NEW UPDATED EDITION! Renowned for their amazing athleticism and unparalleled work ethic, and famed for their “great heart” and willingness to go the extra mile, off-track Thoroughbreds (OTTBs) have proven to be the ultimate equine partners in a host of disciplines: dressage, eventing, show jumping, trail riding, and even barrel racing and ranch work. 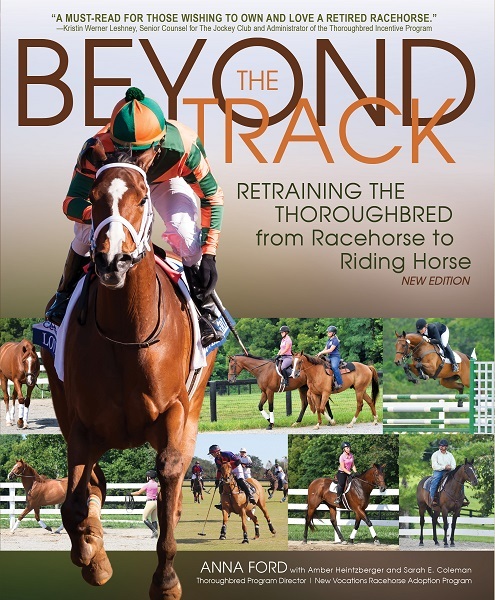 In this revised edition of the book that Thoroughbred and horse training experts have called “breakthrough racehorse literature,” “superior,” “a winner,” and “the ultimate in training manuals,” readers learn everything they need to transition an OTTB from life at the track to life out back. Author Anna Ford, Thoroughbred Program Director at New Vocations Racehorse Adoption, begins by discussing the typical Thoroughbred's early years, then explains reasons for retirement, common injuries and health issues, basic feeding and nutrition, and safe handling. Ford goes on to provide step-by-step instructions for building the solid educational foundation the OTTB needs to excel in a new career, whether as a highly trained competitor or a pleasure mount. With hundreds of quality, full-color photographs to illustrate conscientious and professionally tested training methods, case studies that share how other individuals have successfully retrained ex-racehorses, and the recommendations of top equestrians–including event riders, jockeys, horse trainers, and leading industry magazines–this book is the go-to reference for anyone interested in pursuing a partnership with a Thoroughbred athlete. Anna Ford is the Thoroughbred Program Director for New Vocations Racehorse Adoption, which was founded in 1992 to offer retiring racehorses a safe haven, rehabilitation, and continued education through placement in experienced and caring homes. Over 6,600 retired Thoroughbreds and Standardbreds have been placed in qualified homes through New Vocations' efforts since its inception. These horses have come from 40 different racetracks and have been adopted by families throughout the country. Ford grew up deeply immersed in the racing industry as her father is a fifth-generation trainer. She rode Thoroughbreds throughout her youth and showed in a variety of disciplines. Ford was an exercise rider during college prior to her position with New Vocations. She also trained and instructed internationally, and is Masters Certified through the Certified Horsemen's Association. She was a founding member of the Thoroughbred Aftercare Alliance and sits on the Advisory Board. Visit www.newvocations.org for more information about New Vocations Racehorse Adoption.